The Decorating Chica: Should I Paint? We have lived in this house since 2004 and 12 years I have been mulling over my brick fireplace. You see my house is a 70s built traditional 2-level house with the 'family' room in the back that has a brick fireplace that fills the. whole. wall. Seriously. This is the fireplace in our back room. When we moved in the mantel was dark wood and the bookcases had dark brown paneling lining the back and the shelves and frame was all dark wood. Because the room has one patio door for natural light, this made for a VERY dark room. Additionally the wainscotting was also the same dark brown paneling. So in my efforts to lighten the fireplace and room I white washed the mantel and added the decorative element, painted the shelves white and actually added a gold metallic glaze over the top of the brick to make it shine and reflect light. White washed mantel and painted shelves brighten the space. I have been on the brink of an update but have hesitated every time. Why you might ask? Because once you paint brick there is no turning back (well unless you sand blast it!). So I wanted to be very sure that it was the right thing to do. 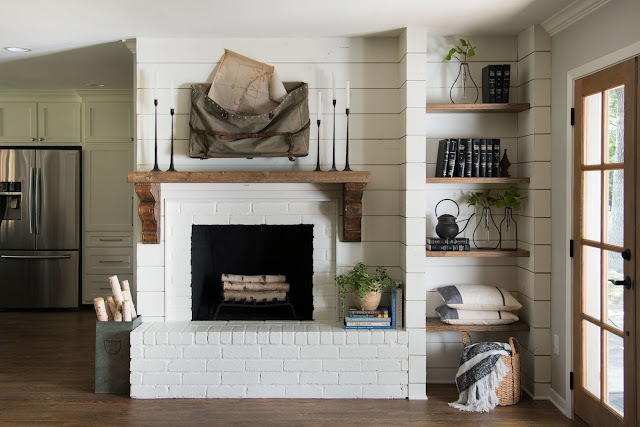 After seeing a Fixer Upper episode the last week of February of The Severn's I loved the shiplap and painted brick combo fireplace redo. Which has started me thinking it all over again and I realize it is time to take the plunge. The Severn's home remodel and updated fireplace from Fixer Upper. While this is my inspiration, the end result will be my own version of this. Besides, it is the first step in a whole room update which is long over due! I would love to hear your thoughts. Have you ever painted and updated an old brick fireplace? Were you satisfied with the end result? Would you do it again?